The Maya commemorated important events by building stone stelae. These always had the date and described the occasion with Maya glyphs and numbers. We find many of these stelae still standing today in the ancient Maya cities all over the Maya World. As you can see to the right, the custom-made Maya Stela made by the Maya World Studies Center is a drawing that follows that tradition. It is finely color printed on letter size, gloss finish, quality stock. The stela shows with the corresponding Maya glyphs and numbers the date you wish to commemorate according to several Maya Calendars. The Long Count, also called Initial Series is one of these. 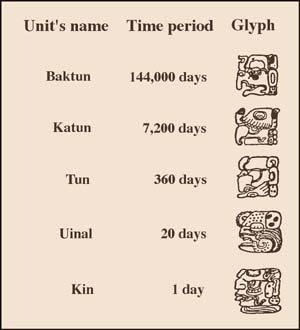 This is a very exact calendar since it is actually a count of the days (KIN) that have passed since the start date of this Maya Era on August 13, 3114 BC. The representation of this Long Count date occupies most of the area of the stela. The glyph at the top of the column is called the introductory glyph, which basically says "Here comes an important date". Continuing reading towards the bottom starting at row 2 each one of the Maya glyphs on the stela represents a period of time (an amount of days or KIN) and the Maya number in front of it states how many of these periods are taken into account, the product of the multiplication of both these elements (glyph value x numeral) and the addition of the other similar products obtained from the following 4 rows will give the amount of days that have passed. The last two glyphs on the bottom portion of the stela with their numerals represent the position of the day commemorated by the stela in two other Maya calendars. The bottom row shows the date in the HAAB which is their civil calendar of 365 days. And the row directly on top of the last shows the same date in the TZOLKIN or ritual Maya calendar of 260 days. We usually print on the top portion of the page, besides the Maya Long Count date written in Arabic numbers, the date in English and something relative to the event being commemorated. Taking into consideration the space available, other print options are also possible upon request. The whole page may be framed. It is a great gift to commemorate the date of an event worth remembering. To guarantee the permanence of our stelae quality materials are used to manufacture them, although we doubt very much that they will last as long as those built in stone by the Maya. 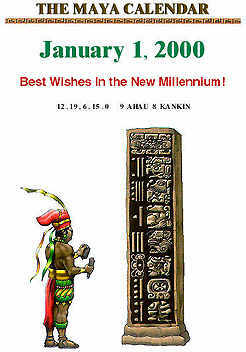 The Maya World Studies Center asks for a contribution for the custom made Maya Stela, plus S&H. The custom made stela will be sent to you by registered mail from our headquarters in Merida, Yucatan, Mexico.